Discussion in 'Garage' started by squiggy, Apr 12, 2019. Get ready for an all-new Chevrolet Corvette. On July 18, General Motors will reveal the latest version of "America's sports car." It's big news anytime a new Corvette is unveiled, but this one will represent, arguably, the biggest change for the Corvette since the model was first introduced in 1953. 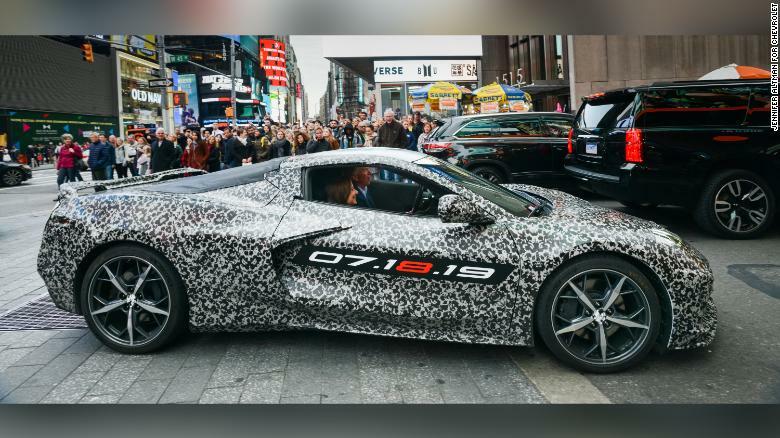 The Corvette's chief engineer Tadge Juechter and General Motors CEO Mary Barra drive in a camouflaged next-generation Corvette near Times Square. Putting the engine behind the driver and passenger -- called a rear mid-engined layout -- places the heaviest single part of the car as close as possible to the vehicle's absolute center. This way, the car is balanced in its handling, being neither especially heavy at the front or at the back. Having the engine more toward the rear also helps during hard acceleration since there is more weight to hold down the rear wheels that power the car. The Corvette has long been a legitimate performance competitor, especially considering its relatively low price. While it's far from cheap -- the entry level Corvette starts at almost $60,000 -- its performance rivals that of cars costing six figures. But there is a limit to the capabilities of any car with a front-engined design and, evidently, GM engineers decided that it was finally time to make that change. "There's more potential in the mid-engined platform in terms of performance applications than there is in a front-engined car, that's for sure," said Travis Okulski, editor-in-chief of Road & Track magazine. It's not the first time GM (GM) has considered it. The company even built mid-engined research cars called CERV I and CERV II (Chevrolet Engineering Research Vehicle) in the 1960s and the CERV III in 1990. The new mid-engined Corvette has been the subject of much speculation in the automotive press. GM finally confirmed it would be unveiled this summer, releasing photos of the car covered in black and white camouflage driving toward New York's Times Square. The new car has the potential to further burnish GM's image as an engineering powerhouse, which has long been the role of the Corvette. It's a "halo car" that brings people into Chevrolet showrooms even if they ultimately end up buying something else, said Okulski, and this version should generate even more interest. "It also gives Chevrolet something that can play on the big stage with the likes of Ferrari, Lamborghini, McLaren, everybody," he said. honda SI 2013 35% tinted glass coupe 136mph! SRT-4 180+! VFR-800-11750 rpm 10.9 1/4 130+! Neon 2001! Forget all that cancer nonsense he's talking about. Im with @webby on this one, I'll be watching with anticipation for sure. You do understand that it is a test mule in the pic? Hence the weird camo “paint”. Also, it’s supposed to be a fast car, that’s the whole point. Since when has a Corvette had a back seat? The only reason I didn't get a sports car, can't even carry a pup tent. Yes relativity speaking, out of 99% of cheapo's price range at over $60,000 or four times what I paid for my Honda. Somehow expensive cars just don't interest me. I buy one when it goes down to a Honda. That paint job looks like crap too I would have more fun in jap two seat. with some dough left to buy a sandwich. That is not paint. It is a vinyl wrap designed to distort the body lines. I am beginning to think you don't really know much about (or, really, just appreciate) performance cars...at all. bauer311, Gitrdone42 and squiggy like this.